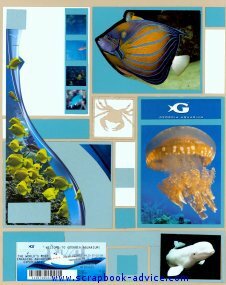 While working on these Aquarium Scrapbook Layouts I found that I actually learned a lot more about the exhibits since I was thinking about doing a scrapbook. or a Great "Staycation" Idea. The SC Aquarium layouts above of the ocean tank and all the colorful fish were taken just at feeding time at the Riverbanks Zoo in Columbia, S C so the fish were all in one location which made it easy get lots of good photos. The main problem here is to take the photos at an angle so as to avoid the flash bounding back from the glass window. Here I have used several cropped photos of single fish as the rest of the photo either had nothing interesting or was bad due to that flash back. 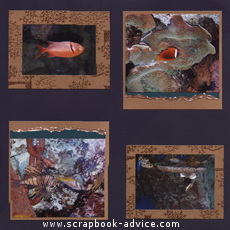 For both of these Riverbanks Zoo Scrapbook Layouts, I used a deep purple background paper with copper metallic images of vines or what I thought looked a lot like Seaweed. On the right layout, I used an 8 1/2 x 11 sheet of copper that also had the embossed vines. All mattes for this layout were plain copper and the fibers in the tags were purple. All papers and fibers came from the Club Scrap Renaissance Kit of February 2003. 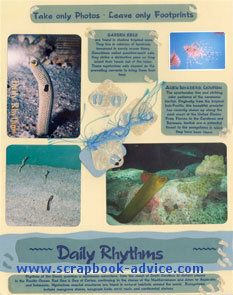 These two Riverbanks Zoo Scrapbook Layouts above both used the same photo layout, four photos in the four corners. 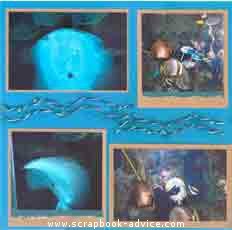 The background papers were deep purple and dark aqua with copper metallic matting. The copper was the color that tied these two layouts together as so many of the images in the photos had colors that were either copper colored or in the same family. 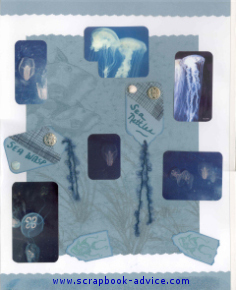 The photos of the stingray from the underneath tied in the Aqua background paper. You can't tell from the photo, but the stingray had a very tiny face that looked almost human - thus the picture. 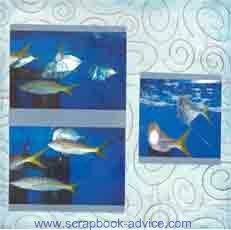 Some of the photos are double matted with a torn piece of the aqua for the mattes directly under the photos. The white core of the torn paper was partially inked with a copper colored pen. Some twisted fibers of 3 colors of teal enhance the one layout. 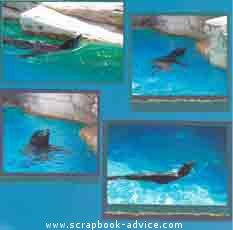 Both of these Riverbanks Zoo Scrapbook Layouts used background shades of teal to match the water in the Sea Lions Tank. All but one of the photos is double matted with Teal and Purple (from Club Scrap's Renaissance Kit). One of the double matted edges on each is torn and enhanced with the copper colored pen. The Title Tag has purple and teal Fibers and has a triple torn edge, enhanced with the copper pen. These two layouts of the Fish and Jellyfish are done on a metallic paper with gold embossed swirls that I thought resembled water. The matting was done using Bazzill Bling paper, which is a metallic sheen paper in a coordinating light blue. 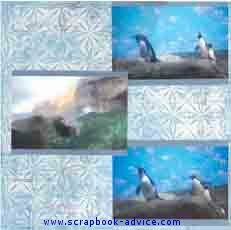 These two Aquarium Scrapbook Layouts of the Penguins use the same type of metallic blue paper, but this time with what looks like snow flakes. I thought it expressed the cold temperature normally associated with Penguins. The matting was done using the same Bazzill Bling paper as in the layouts above. 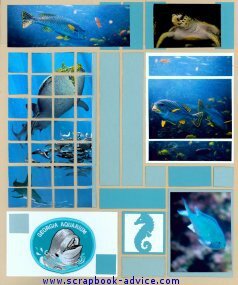 Here are a couple of Aquarium Scrapbook Layouts done using only items collected at the Georgia Aquarium - the entrance ticket, a brochure, post cards and patches. Of course, I took photos, but you don't always need to. to purchase Tammy's kit layouts and products. 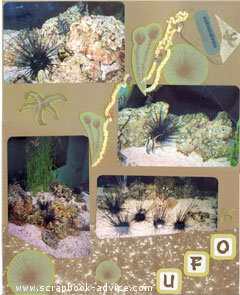 The photos on these pages of the South Carolina Aquarium show the Rocky Reef were developed in Panoramic Format, 4 x 12 inches. I was trying to capture the immense size of the Great Ocean Tank. 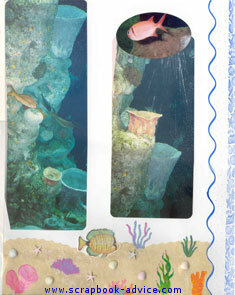 The border along the bottom is made from a sandy textured paper that came with the Club Scrap kit By the Seashore, July 2003. I had planned to tear this paper to represent the edges of the sand bar, but it was too strong. Instead, I cut layers of it with the scalloped scissors, taped each layer to the bottom of the page. I also added several types of stickers I picked up at The Aquarium along with small shells and starfish that I picked up at my local Scrapbook Store. The Pink Angelfish are embossed with a metallic pearl embossing powder using a stamp that came with the kit. They were stamped on a separate piece of white card stock and then cut out prior to being attached to the layout. The title was done using the Letter Squares that came with the kit and the other journaling was done on the Computer using the same font as the one provided in the kit. 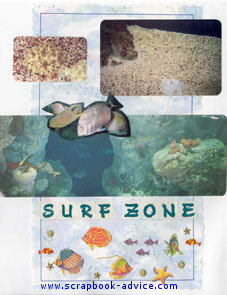 These two SC Aquarium Scrapbook Layouts of the Surf Zone were done on a white background paper and using one 8 & 1/2 x 11 page of paper with fish on the bottom. 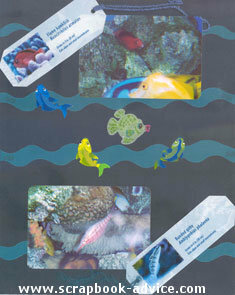 The fish paper was enhanced with a few left over metallic stickers and metallic brads of star fish and scallop shells. 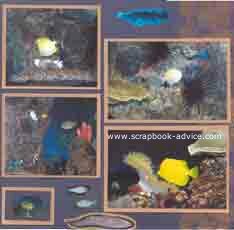 Also used an an embellishment, a group of fish clustered together was cut from a photo, matted on dark purple card stock, and placed above the panoramic photo. 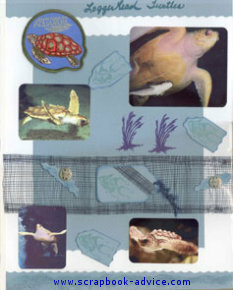 These two Aquarium Scrapbook Layouts of the Sea Nettles and Loggerhead Turtles are very simple and are done on a white background. Each page has one sheet of 8 & 1/2 x 11 patterned paper in the light blue from the Club Scrap By the Sea Shore collection. The top and bottom Border Strips and Tags were also done using the same blue paper, and were stamped and embossed in a light pearl embossing powder in a wave pattern that does not show well in the photo. 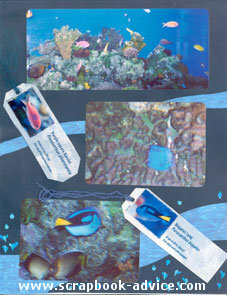 Other embellishments include the darker blue Coastal Netting, used across the page and to embellish some of the tags. The tags were scattered around the layout like fish. 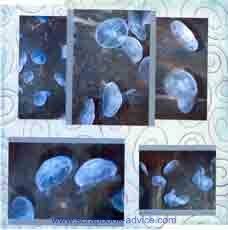 Teal Fibers are attached to the tags and are purposely left hanging down like the Sea Nettles and Jelly Fish. Also used were the Gold Starfish brads and a Patch purchased from the Aquarium to represent the Loggerhead Turtles. 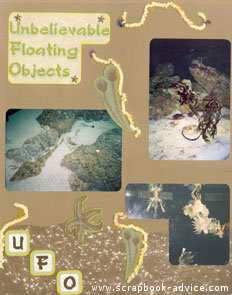 The SC Aquarium Scrapbook Layouts of the UFO section of the Aquarium, The Unbelieveable Floating Objects, are done on a tan background paper with the bottom border done in another Sandy Textured paper from the Club Scrap By the Seashore kit, this one in a dark brown with more contrast. The Title box was done on the computer using the same font provided in the kit. The UFO at the bottom was done with individual squares cut a little larger than the lettering squares. 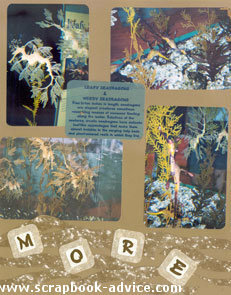 Light tan fibers were used along with cut out shapes from the embellishments that came with the kit and are done to represent Sea Weed. These layouts titled More UFO's were done in a similar fashion with the Dark Brown Sandy Textured paper as a border on the left, and on the right hand page, it cut into wavy strips. The title using the letter squares on card stock. 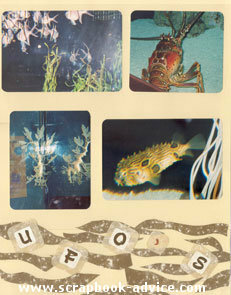 The Journaling block on these Aquarium Scrapbook Layouts was done on the computer in the same font that came with the kit and printed on teal vellum paper. 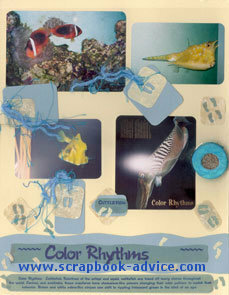 The titles for these two Aquarium Scrapbook Layouts pages, Daily Rhythms & Color Rhythms were take directly from the gallery walls at the Aquarium. 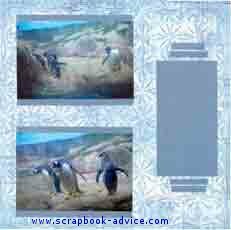 The Journaling at the top says: "Take Only Photos, Leave Only Footprints" and is the idea behind the embellishments on these pages. I punched out footprints from scraps of the light tan Sandy Textured paper and placed them all over the layouts, on tags, journaling and title areas. The round teal circle on the right layout is a Shaker Box filled with tiny beads, also from the By the Seashore Kit, that are a mixture of beads in tans and browns. I used an aqua Mulberry paper to cover the top of the shaker box. 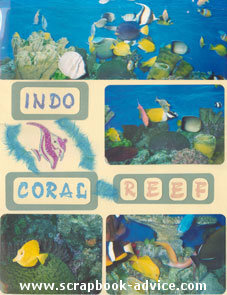 The pages for the Indo Coral Reef were done on tan and white background papers. 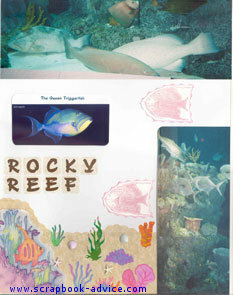 The Title was done using Rubber Stamps of the font that were ordered additionally for the Club Scrap By the Seashore kit, in several colors of ink and embossing powder, to match the many colored fish found in the salt water near the reef. 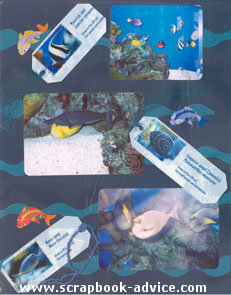 Fish stickers purchased at the Aquarium were scattered about. 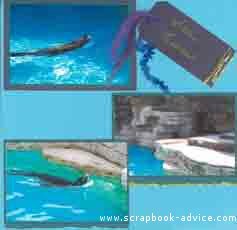 Along with the stickers, strips of Mulberry paper were placed in the white spaces to represent the beautiful blue water. 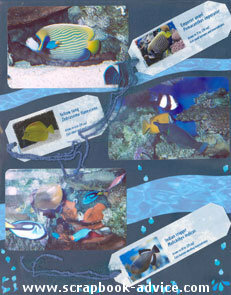 These Aquarium Scrapbook Layouts of the Coral Reef were done on dark blue card stock with wavy strips of water printed paper. 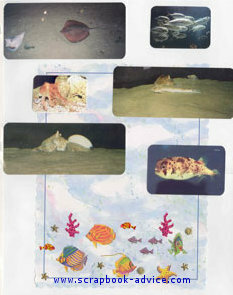 Photos of the multi colored fish and their names & descriptions were cut from a plastic tour guide card that was damaged and thrown away. I just asked if I could have it for my scrapbook. These were cut in the shape of tags and holes were added for fibers in the teal colors. I had some tiny stickers of water droplets and bubbles that I placed in groups around the bottom of the pages. 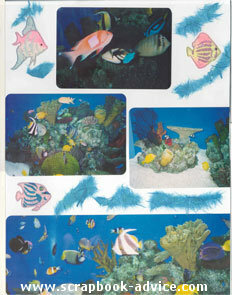 These additional layouts of the Coral Reef were similar to the previous ones, only using some fish stickers purchased at the Aquarium. 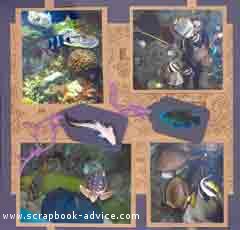 I hope you have enjoyed these Aquarium Scrapbook Layouts and will be able to use some ideas for your own. Even if you copy them exactly they will be with your own photos and will look completely different. Good Luck and Have Fun remembering your trip to the Aquarium.